Mud and sandy bottoms are the typical home environments for this smaller game fish. Migrating with its spawning cycle, the Southern Kingfish moves between water up to 30 ft deep when spawning during the summer months, and shallower inshore estuaries during the rest of the year. Description: The Southern Kingfish can be identified by its silvery/tan coloring with darker bars of color stretching over its body. Like it's relative the Gulf Kingfish, the Southern Kingfish has a small, under-drawn mouth, which makes it harder to hook. Size: Don't be fooled by the small average size of this fish. Southern Kingfish can be up to 16 inches long and under 2 lbs. Though the Southern Kingfish typically weighs under one pound, the firm flesh and high meat yield of this fish make it perfect for filleting. Location: The Southern Kingfish prefers quieter channels, and is more tolerant of low-salinity shallows making it commonly found more inshore. During the summer months of May and June, the Southern Kingfish can be found in deeper offshore waters up to 30 feet, where they travel to spawn. 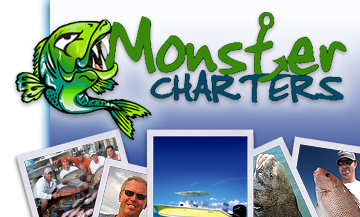 Contact Monster Charters today for more information on the best places to snag a Southern Kingfish and our available charters in the Tampa, St. Petersburg, and Clearwater areas!